Indisputably the most corrupt man in the Corellian government, Councillor Torvix gladly signed on to join the Empire when it invaded Corellia. The councillor used his shadowy network of organized criminals and pirates to enforce order in the so-called "Black Hole"--a dangerous section of the Corellian Labor Valley used to process hypermatter, the key fuel for lightspeed travel. The mountainous ice planet Ilum is home to one of the Jedi Order's most distant outposts. Nestled between snow-covered crags is an enclave used by the Jedi for generations, a shelter from the cold and a launching point for journeys into Ilum's exotic crystal caves. These caves produce some of the most rare and powerful lightsaber crystals in the galaxy. 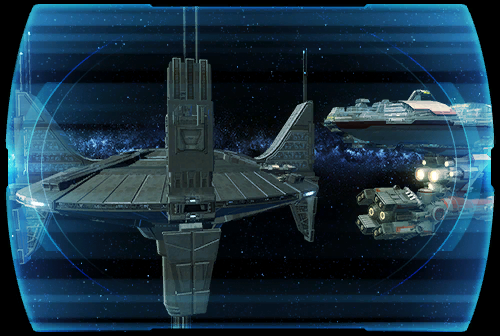 Of the many stations peppered throughout Imperial space, none rival the size or importance of Vaiken Spacedock. Vaiken is the true hub of the Imperial fleet, a logistical nucleus responsible for the vast majority of the Empire's military operations. In fact, the base has become so vital that it has been named after the Sith Empire's first Grand Moff, Odile Vaiken. Despite its usual complement of several dozen capital warships, Vaiken Spacedock is also one of the Empire's most well-guarded locales. Vaiken is commonly upgraded to the latest in shielding technology and detection sensors, and its vast arsenal has a combined destructive power that could potentially lay waste to a small moon. Few planets have been as important to both sides of the war as Manaan. But with its surface covered completely by water, and with its native Selkath population having adopted an isolationist stance, access to the planet can be difficult to come by. The Selkath economy's reliance on the export of kolto to the Republic and the Empire does provide opportunities to visit, but guests are typically limited to the world's few trading platforms--the only surface structures not affected by the Empire's bombardment of the planet during the Great Galactic War. Millennia of Rakatan dominion over the planet and a predominantly unexplored ocean floor evoke strong temptations to probe Manaan's crushing depths. However, due to the strategic importance of its kolto reserves, Manaan will have to largely remain a mystery for now. Devastated by the Sith centuries ago, the planet Ossus has largely been forgotten by the greater galaxy. Enshrouded in the nebular material of the Cron Drift, the planet is difficult to even reach, with those who survive the journey discovering only hazardous wastelands and abandoned ruins on its surface. Though it was once a notable center of Jedi culture and learning, the planet has rarely been visited by members of the Jedi Order in recent decades, as Ossus is located well within the Sith Empire's sphere of influence. For their part, the Sith have shown no interest whatsoever in exploring the planet; what purpose could be served by visiting the charred grave of an already-defeated foe? Many thousands of years ago, in the sparsely populated Tempered Wastes of the Unknown Regions, the first galactic authority was born on Rakata Prime. Named for its once-predominant species whose Infinite Empire ruled for millennia over hundreds of worlds, the planet is now a dangerous tropical wasteland, ravaged by weapons of mass destruction and overrun with deadly beasts and savage Rakata. While few traces of the advanced Rakatan civilization exist on the planet today, it is undoubtedly a treasure trove of lost knowledge and technologies--and not just their own. A nullifying field once employed by the Rakata commonly disrupted the navigational systems of orbiting vessels, causing them to crash into the planet. As a result, Rakata Prime has become something of a starship graveyard. During the final months of the Great Galactic War, the Republic became desperate to develop a new hyperroute for supplies in their conflict with the aggressive Sith Empire. To facilitate their new route, a nearly forgotten supply base known as Outpost 22 was returned to full service. By the time the Treaty of Coruscant was signed and the war had ended, Outpost 22 had become such a major hub of activity as to be as indispensable a gathering place as the capital world itself. The base was given a new and significant identity--Carrick Station--in dedication to Zayne Carrick, a once-unassuming Padawan who rose to a position of great importance during the Mandalorian Wars. The prison world of Belsavis remains in turmoil. Though the Republic has managed to gain tentative control over much of the main prison complex, agents of the Empire have succeeded in freeing many of their captured comrades and continue to recruit new forces from among the prisoner population to bolster their armies. Located in the Ghost Nebula, Umbara earned the name "Shadow World" for its eternal darkness and misty landscape. In isolation from the rest of the galaxy, Umbara's population developed engineering feats far outstripping those in known space. Most notable is Umbara's research into technological uses for Adegan crystals. Though offworlders have no issue breathing the planet's dense atmosphere, native Umbarans' delicate systems require special helmets in order to breathe. Preferring solitude and secrecy, Umbarans rarely leave their dark homeworld, opting to isolate themselves from the rest of Republic space. This, alongside their stealth combat proficiency and natural preference for darkness, led offworlders to dub Umbarans "Shadow People." Situated in the heart of Imperial Space, Ziost has long played a vital role in the intricate history of the Sith. For thousands of years, in fact, the craggy, arid world served as the ancient Sith Empire's capital until infighting splintered its leadership. Today, Ziost remains an important commercial, political and population center of the Empire--this in spite of its shift from a warm climate with dense forests to a bitterly cold tundra. Whether this environmental turnabout is due to geological reasons or eons of dark side influence remains a subject of scholarly consideration.